Once you master knits and purls, you’ll be able to start making simple knitting stitch patterns. The garter stitch, stockinette stitch, seed stitch, and rib stitch are great for beginning knitters because they are made with only knit and purl stitches. Different combinations of knits and purls create a varied range of fabrics. This handful of stitch patterns is composed of the most basic stitches that you will want to know about. Most of these patterns have short abbreviations that can seem complex, but these very simple stithes are just made up of knits and purls. If the abbreviations in a pattern seem confusing, go here to learn how to read knitting patterns more easily. Garter stitch is a knitting pattern that is composed of all knit stitches. When knitting a regular flat piece, you will knit all the stitches in one row, turn, then knit all the stitches in the next row, turn, and repeat. This creates a ribbed fabric that looks the same on both sides. 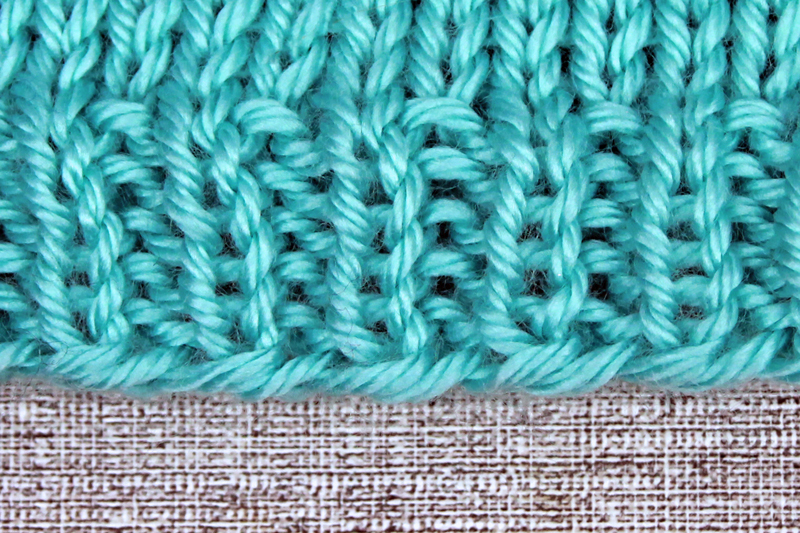 Garter stitch has a very simple abbreviation: “k” every row. Practice the garter stitch with a simple scarf here, pattern here. 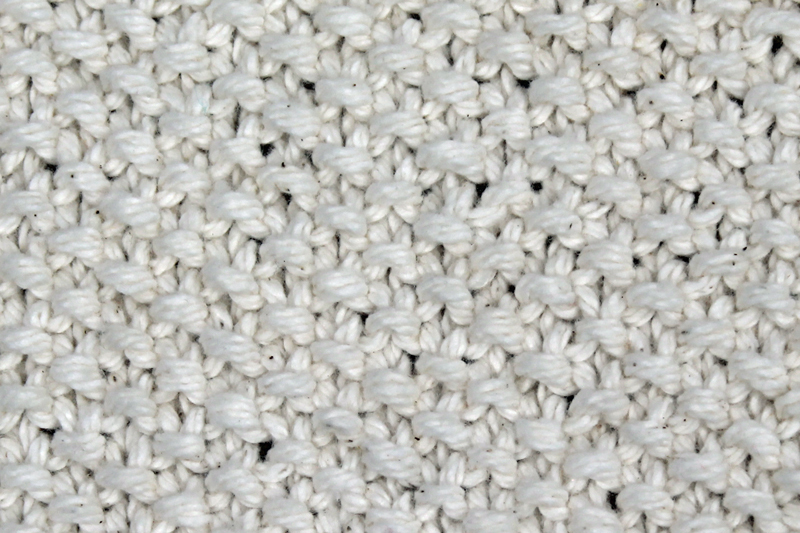 Stockinette stitch is one of the most widely used knitting patterns. To create a stockinette stitch, you knit one row, turn, purl one row, turn, and continue alternating knit rows and purl rows until your square is finished. This is usually abbreviated with *k 1 row, p 1 row. * A stockinette stitch creates a flat knitted panel that has a pattern of “V” shaped stitches on the front or “right side” of the fabric. Cast on an even number of stitches. *Knit, purl* repeat for one row. Turn. *purl, knit* repeat one row. Turn and repeat these two rows until you’re finished. So, for seed stitch you knit into the purl stitches of the row below, and purl into the knit stitches. The abbreviated verson of this would read: c/o even number of stitches. *k, p* one row, turn, *p, k* one row. Repeat. Try my free seed stitch washcloth pattern for practice on this stitch. Knit, purl rib is a frequently used stitch for ribbed borders on clothing like hats, mittens, and sweaters. To knit this type of ribbing, cast on an even number of stitches. *Knit, purl* repeat for one row. Turn, and repeat the same row. You will be knitting into the knit stitches and purling into the purl stitches of the row below. Abbreviated, a rib pattern will often read: c/o even number of stitches. *k, p* every row. After you understand these basic patterns, you can make lot of different fabrics with the same ball of yarn. It is a great time to start exploring fun beginner patterns and learning new skills. My free beginner knitting patterns use the stitches above to make some nice things. I’ve started a Pinterest collection of my favorite knitting patterns from my site and from other great knitting designers around the web. Look there for more great knitting ideas. Now that you’ve learned how to knit some basic stitch patterns, you’ll want to find out what a “gauge swatch” is and why your patterns will ask you to make one.